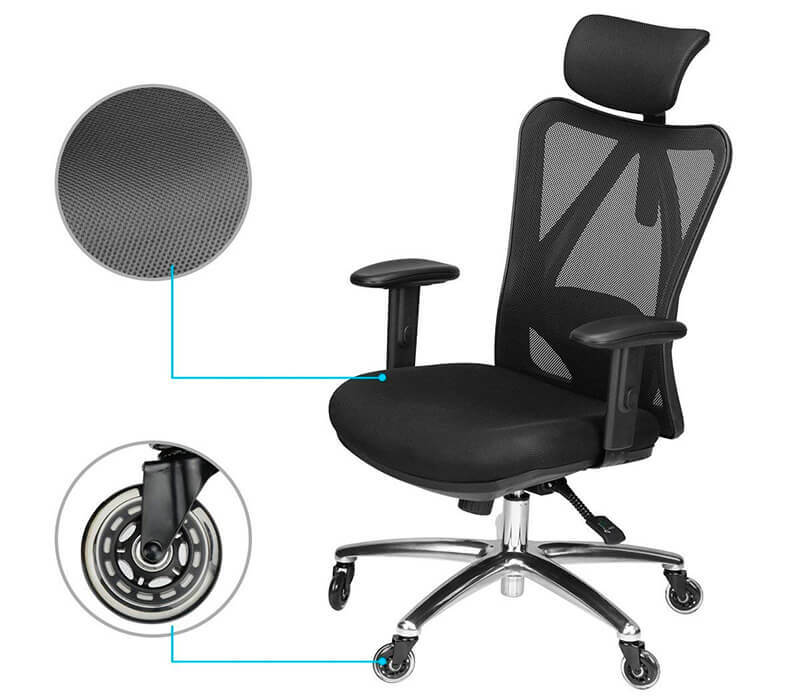 Computer Chair With Rollerblade Wheels – Which One Should I Choose? Your old chair had plastic wheels which would leave scratches all over the floor? You can’t stand the ugly plastic mat on your beautiful old wood floor? Or maybe you just got new hard wood floors and now you’re looking for a chair with wheels that would not leave any marks? There’s simple solution for these situations: computer chair with rollerblade wheels. It’s not easy to find an ergonomic chair that would be already equipped with the rollerblade wheels. Actually I found one model that I can recommend you – Duramont Ergonomic Adjustable Office Chair. This computer chair comes with rollerblade wheels which work perfect on wood floors*. They roll easily and don’t scratch the floor. *This rollerblade wheels can move over carpet as well, but they won’t roll as smooth as on wood floors. They are designed for non-carpeted floors. But that’s not all features this computer chair can offer you. It has ergonomic design that helps you to keep proper, healthy posture. 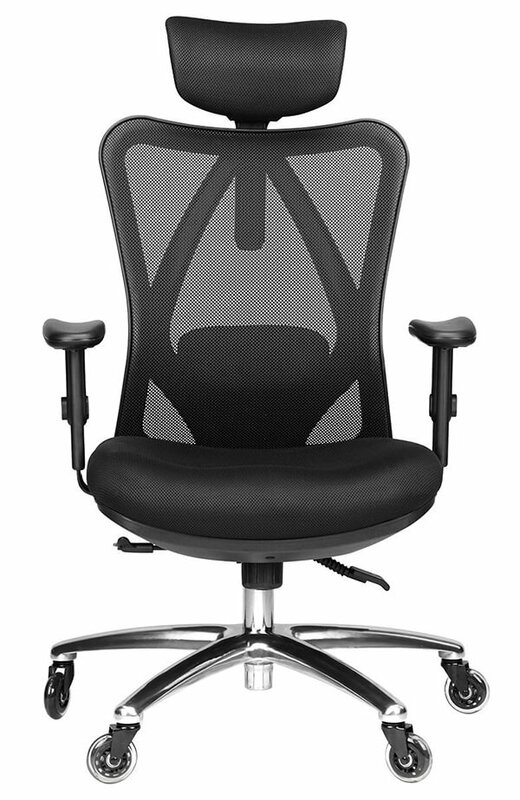 Duramont Ergonomic Adjustable Office Chair has high S-shaped backrest. There is adjustable headrest which you can move up and down and change its angle. Lumbar support is also adjustable by height and depth (how much support you feel). Lots of customers praise this computer chair for the lower back support. There is also recline function with adjustable tension so you can find proper position whether you want to relax or sit upright during work. Thanks to these functions users with different body type are able to find the most comfortable and supportive position for themselves. This ergonomic backrest gives awesome support not only for lumbar spine, but also for sacrum and upper part of your back, shoulders and neck. Forget about back soreness, sacrum pain, tension in shoulders or neck tightness. With this computer chair you’ll be comfy and pain free even if you spend several hours per day at the desk. Besides, the back and the seat are covered with mesh which doesn’t block the air circulation. No more sweating on a chair, no more hot and sticky thighs. There are also 2D armrests for even better customization. You can changes their height and width to find the most supportive position for your elbows and wrists. Duramont Ergonomic Adjustable Office Chair has weight limit of 330 lbs and it’s perfect for average in height people (up to about 6’4’’). You’re probably wondering if such a well-equipped computer chair with rollerblade wheels is expensive. Well, it’s a medium-price range chair. I think it’s a great deal considering you’ll get such a high-quality ergonomic chair with so many adjustments for less than $300. Solution For People With Lower Budget – Replace Your Old Wheels! Okay, but what if you don’t have that kind of money or simply don’t want to change your chair? If you’re satisfied with your chair and the only problem are the wheels, you can just replace them! You can purchase rollerblade wheels for your chair separately. I found on Amazon awesome wheels which are incredibly popular and highly-rated by hundreds of customers. 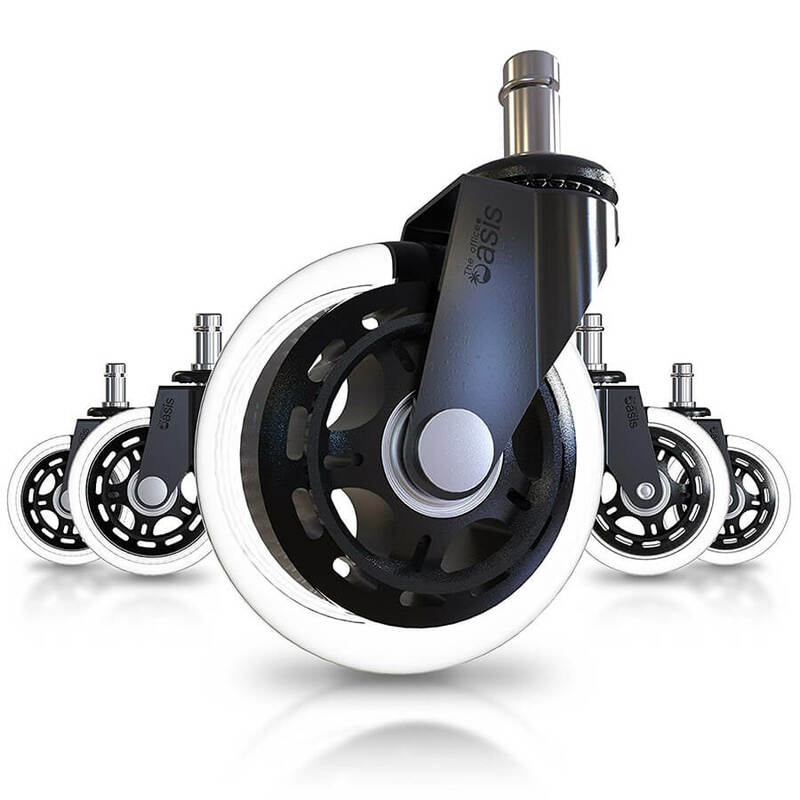 Office Chair Caster Wheels from The Office Oasis are universal and fit on majority of chairs. They are compatible with chairs from brands like Herman Miller (e.g. Aeron and Embody), Alera, Hon, Amazon Basics and DXRacer. These rollerblade wheels work amazing on hard wood floors without any scratches or grooves. 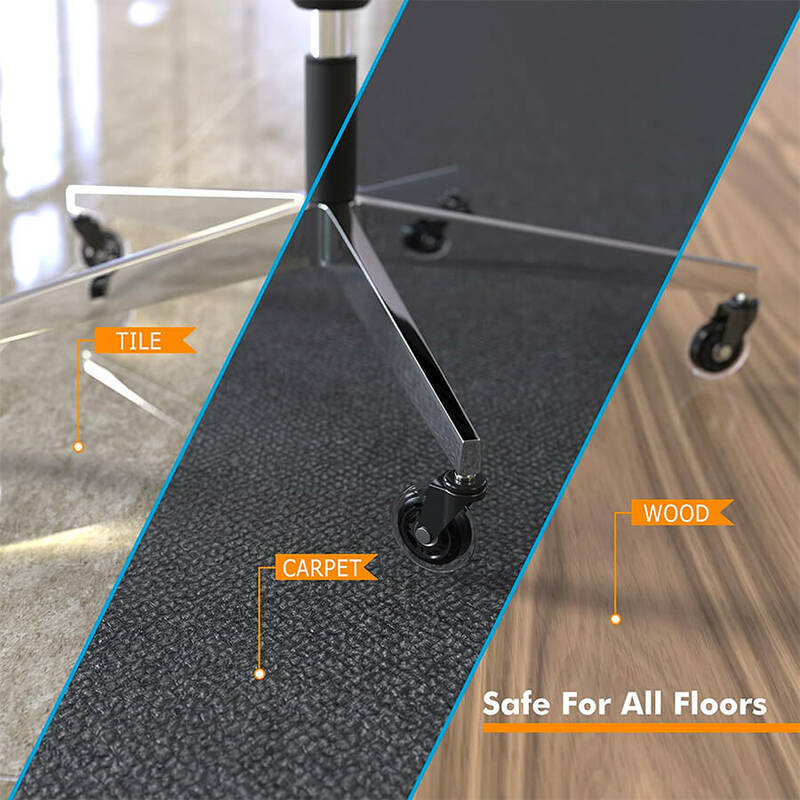 They allow you to roll smoothly over your beautiful, expensive floors without worrying about damages. According to customers on Amazon The Office Oasis Rollerbade Wheels are very quiet and turn with no effort. Some people use them on very old wood floors or tiles and they don’t leave any marks. So if you’re on a tight budget or simply like your current chair (besides the wheels), getting these rollerblade wheels is a great solution.